The FA Cup takes centre stage this weekend and Coral offers you great promotion to bet on the most prestigious championship in Enlish football. Open an account and enjoy the match between Arsenal and Hull City. 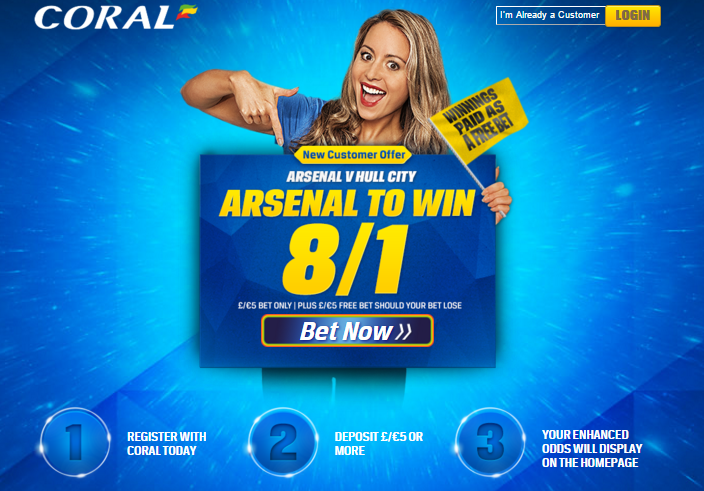 To get this promotion you only need to open a new opening an Online, Mobile or Coral Connect account in either £/€ and bet on Arsenal to Win against Hull City – 8/1. It is essential to place your first real money bet as a win single £/€5 in its “My Markets” sections. This offer is avalaible to UK & Republic of Ireland residents in either £/€ currency until 12:45 GMT Sasturday 20th February. Remember that accounts registered via any other source than online or mobile do not qualify.